What is making a selection? Making a selection in Photoshop allows you to specify a specific area that you either want to work on or not work on. Another way to describe it is to protect a specific area of an image. By making a selection you are telling Photoshop that you need to only allow your retouching to effect the area or areas that are selected while protecting the areas that are not selected. There are lots of different methods to create a selection and ways to manipulate your selection. So deciding upon which selection tool is the right tool for the job is an important decision to make. Each image is different and requires you to decide the best approach to making a selection. There are many different selection tools and methods of making a selection in Photoshop. Understanding each selection tool will allow you to make a better decision about which tool is the right one, making your photoshop retouching more efficient and the end result stronger. Lets look at some of the different selection tools. In your tool bar to the top left of your Photoshop interface is where you will find your selection tools. In the screen shot of the selection tools you can see there are three main tools to select from, when you select each of these tools more options will appear. 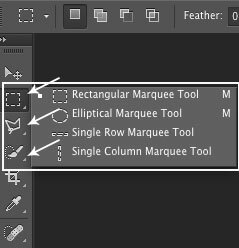 Rectangular marquee tool – The first arrow points to selections that can be made in a square / rectangle or circle / oval shape. Holding shift will constrain proportions. Elliptical marquee – The second arrow points to selections that can be made using freehand making any shape, a straight line and a magnetic tool that will look for an edge. Quick selection tool – The third arrow you will find the quick selection tool and the magic wand selection tools. These and the magnetic lasso tool work in a similar way. They are looking for areas of contact to determine where the selection should adhere to. So where there is a defined edge (i.e. distinguishable colour contrast) these selection tools can be really useful. On areas where there isn’t a defined edge these tools are much less effective. To remove a selection entirely or to de-select click anywhere on the image using a selection tool or under the ‘Selection’ pull down menu choose the ‘deselect’ option. Using Command D also does this. At the top of the screen shot you can see a series of boxes. When they are selected while you are making ‘Selections’ they can either add or subtract without you needing to hold down the shift or option keys. Your selections will have a hard edge and this can be modified by using a feathering option. Selections can be infinitely adjusted, refined, feathered and saved for using at another time, I will cover these in another tutorial.